Updated for MC 1.2.5 and Buildcraft. There is a lot of things going on currently. We have forked Additional Pipes from Zeldo (with his permission), so this Fork will fall under new Copyrights, Disto ability, etc. Additional Pipes also now has a Co-Developer and he goes by the screen name of Kyprus, show him some love if you see him, he has put a lot of time into this release. Teleport Pipes GUI Redesigned. Frequency can now be named and saved inside the GUI. Teleport Tethers will now load chunks on startup and keep the chunks loaded. Teleport Tethers now show up in Creative Inventory. Updated BuildCraft 3 version to 3.0.10. Numerous small Bugfixes with the way the pipes connect to each other and such. New version of the Buildcraft 3 build. Should work correctly with Logistic Pipes now. Fixed Issue with Distro Pipe not keeping save state between reloads. Forge Chunkloaders have been added. The Chunkloaders have been renamed to Teleport Tethers and should work in any Dimension, recipe did not change. Conductive Teleport Pipes are now Lossless (They don't "loose" power anymore) for all current versions. Teleport Pipes should work in all Dimensions now, Note: Not cross Dimensions, just inside each one. The Nasty Cast error in the BC3 version where placing pipes near conductive, etc pipes would corrupt your world has been fixed. Teleport Tether crash in ssp fixed. SSP and SMP has been tested and I would like to toss a thanks out to Kyprus for assisting in debugging and testing. Buildcraft 3 Version Posted. There is BUGS in this version. DO NOT place a water pipe next to a Conductive Teleport Pipe, you world will Corrupt. Other than that.. Have fun. recompiled and fixed issues with Forge 1.3.1. Anyone having issues using Additional Pipes on SMP should use this for the client and Server. Configuration variable added to config file for Conductive Teleport Pipe Loss. The default is 0.995 percent per block distance. The config setting can be adjusted for client or server versions. Removed some debug information from displaying on the console for the Client/Server. Uploaded a ALPHA build of AdditionalPipes for Buildcraft 3.1.2. This has quite a few changed inside the "engine" of additional Pipes so as usual, Your mileage may very with this one. Let me know if you run into any issues with it. Uploaded a new server version. Clients should not need a update. If you have downloaded the server version please re-download the new server version, this should allow clients to connect now. 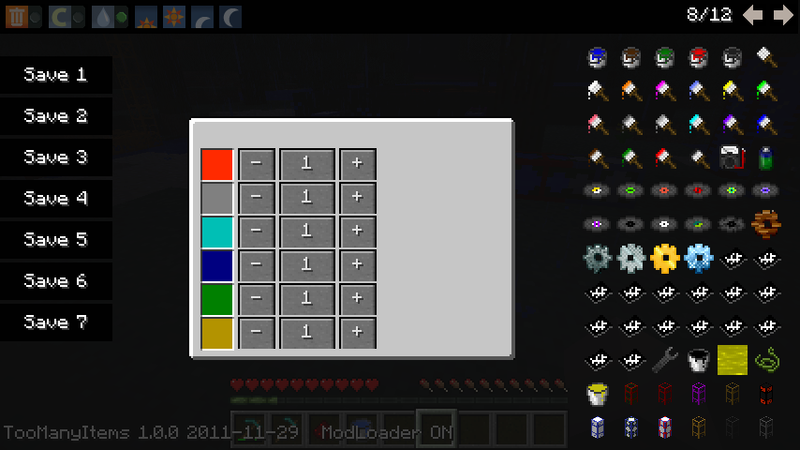 Changed the Chunkloader recipe to 8 Iron ingots surrounding 1 Lapis. You will get 4 Chunkloaders for this recipe. Changed the Default Block ID of the chunkloader to 179. This should stop a majority of the Block Conflicts. Existing configs should not be affected. This is a "experimental" version since forge 1.3.0 is know to have a few issues. Your mileage may very with this build. Server Update Only. This should fix the issues players where having with Crashes in the Nether and It should allow the Pipes to function correctly in the Nether and the End. (Clients will NOT have to update, Just the servers.) Thanks to Eloraam for pointing me in the right direction to fix this. Reworked font rendering code. The fonts in the gui's should now display correctly for everybody. Tested with Optifine/Non Optifine, Server side, etc. If you are having issues with texture pack changes in game please be sure to change textures, exit minecraft completely, then restart this usually corrects pink pipes after texture pack change. Texture loading and Override functions have been rewrote with a patch submitted by krapht, Advanced pipes shouldn't override other textures now (lets hope this helps everybody) *NOTE* - Any texture packs prior to this probably had a work around and will need to be redone to accommodate this. Renamed the zip files to help with the order that Buildcraft mods load in. Try it with the new zip file name first. Thank you so much to Zeldo and yourself! Block ID Conflict - Changing to block id 230 fixed the error below... Not sure if correct fix for the issue or not. That would be the correct fix, you could also change the chunkloader id, it is in .minecraft\buildcraft\config\AdditionalPipes.cfg. I think i usually use 243 for the chunkloader when I have redpower installed. --> Update: Doesn't seem to be loading the mod on the server. Just says no item with the ID. Also updated to 2.2.8 of BC to ensure it was not a version conflict... Error still persists. Well to clarify there is no error, just simply is not loading the Mod on the server-side. I just done a fresh install on a local server with BC 2.2.8 and rev31.1 of teleport pipes and they loaded and looked to work, I also tested the chunkloader block and it looks to work also. Be sure that whatever your chunk loader block ID is that it matches the servers. If they don't match.... Strange things can happen. I would need some error dumps, logs or something else to see what is going on with your setup. Turns out the download was corrupted - Redownloaded and worked fine. Hand to change chunkloader id for server as well. Yea - It's working perfectly. Was a corrupted .zip download on the server side and it was not spitting out any errors - Redownloaded the file and it gave the block ID error, changed to match SSP and vola! I recently upgraded to BC 2.2.8 and I saw that you were updating the teleport pipes mod and downloaded and installed however the pictures and graphics for the new pipes and chunkloader are completely off. For example the chunkloader is a purple colored block, all three teleport pipes are small orange blocks and if I right click on them the gray interface is in the upper right side of my screen and the frequency buttons are in the middle of the screen. Did I miss a step installing the mod or did I get a corrupted copy? I tried redownloading the file and reinstalled however I got the same problem. I didnt get any errors from modloader about ID conflicts. FINE: Mod Loaded: "mod_ExpBlock Version 1.6.1"
FINE: Mod Loaded: "mod_RecipeBook 1.0.0"
FINE: Mod Loaded: "mod_Timber 1.0.0"
FINE: Mod Loaded: "mod_ReiMinimap v2.8_02 [1.0.0]"
FINE: Mod Loaded: "mod_EE EEv5.5"
FINE: Mod Loaded: "mod_Forestry 1.2.0.1"
FINE: Mod Loaded: "mod_InvTweaks 1.33 (1.0.0)"
FINER: Adding own oreCopper and smelting recipe. FINER: Adding own oreTin and smelting recipe. FINER: ingotBronze not found, adding own bronze recipe. FINER: Adding own recipe for bronze ingots. FINE: IndustrialCraft2 not found, skipping IC2 plugin. Hrmmm, I haven't tested with out optifine... Are you using a custom texture pack? I have tested this with and without optifine and it looks to work correctly on this side. Are you putting the client zip in the mods folder? You arn't installing this direct into your jar file are you? I'm not using any texturepacks and I installed the mod zip file in the mod folder, I did not install it it in the jar file. Only thing I would suggest is try it without the mod_timber and mod_ExpBlock. I have tested it with all the other mods your are running and I can't recreate the problem. Any chance you can give me links to the above 2 mods? I haven't seen them before. Your GUI overlays have wrong offset? What mod's are you using? Thanks for this! I'll give it a try! found a bug, when i try the power teleport pipe the power does not get past the wooden block. FINE: Mod Loaded: "mod_ReiMinimap v2.8_04 [1.0.0]"
FINE: Mod Loaded: "mod_SpawnerGUI 1.0.0"
FINE: Mod Loaded: "mod_Elevator Minecraft 1.0"
FINE: Mod Loaded: "mod_Backpack Minecraft 1.0.0"
FINE: Mod Loaded: "mod_BuildCraftCore 2.2.7"
FINE: Mod Loaded: "mod_BuildCraftBuilders 2.2.7"
FINE: Mod Loaded: "mod_BuildCraftEnergy 2.2.7"
FINE: Mod Loaded: "mod_BuildCraftFactory 2.2.7"
FINE: Mod Loaded: "mod_BuildCraftTransport 2.2.7"
FINE: Mod Loaded: "mod_LogisticsPipes 0.1.0 (Minecraft 1.0.0, Buildcraft 2.2.7, Forge 1.2.0)"
FINE: Mod Loaded: "mod_crystalWing Minecraft 1.0.0"
FINE: Mod Loaded: "mod_MultiPageChest 1.0.6"
FINE: Mod Loaded: "mod_NetherOres 1.0.0R1.1.0"
FINE: Mod Loaded: "mod_ThaumCraft 1.0.2"
FINE: Mod Loaded: "mod_treecapitator 1.0.0 - v2 - DaftPVF"
FINE: Mod Loaded: "WirelessRedstone 1.4"
FINE: Mod Loaded: "mod_Forestry 1.2.2.0"
But also Zombe's Modpack. I think Zombe's Recipe mod might be causing it. It alters the inventory GUI. Make sure you are using the power pipes correctly, I have tested it with all the BC engines and with Forestry engines also. All of them transport power across the power pipes. What version of BC are you using? do you have any other mods installed? That may be, As is said in the OP, this was a direct port of zeldo's R31 to 1.0.0. I've been looking thru the gui code the past few and have tweaked a few things (i.e. made a mess of it). I'll look into it further to see if there is anything I can do... but I make no promises.